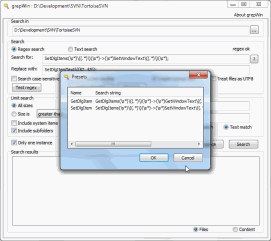 grepWin: Regular expression search and replace for Windows | TryThenBuy-Free & Open Source rocks, help them by buying or donating. In case you're not familiar with regular expressions, we have a very short regular expression tutorial for you. 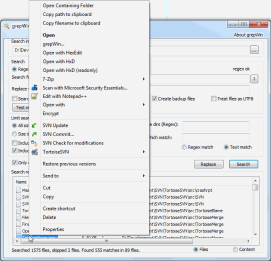 grepWin adds an entry to the shell context menu to easily search selected folders. 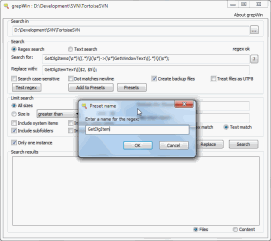 Once started, grepWin allows you to customize the search or replace in many ways. For example, you can (and maybe you should) limit the search to certain file sizes, file types, etc. Since regular expressions can sometimes get complicated, grepWin allows you to add your most used expressions to a presets list. Once you've added some presets, you can easily retrieve them again from the presets dialog. After a successful search or replace, the matching files are listed at the bottom of the dialog. The file list behaves a lot like the common Windows explorer. That means a double-click will open the file, and a right-click will show you the default shell menu for that file. Click the button to open a new browser window to get grepWin Download.